Galvanised steel wire OCF dipole. The model used is not fully exposed, but the results are unlikely unless perhaps the permeability of the steel was ignored (NEC-2 does not natively model µr>1). Above are the gain plots from NEC-4.2 for three different material types, copper, steel, and steel resistivity with µr=1 (-wrong). There is little difference between 160lowdipole-cu and 160lowdipole-steel-wrong, but the latter is an invalid model as permeability of steel is ignored. There is large difference between 160lowdipole-cu and 160lowdipole-steel, about 9dB poorer for steel. One poster recommended his 0.4mm steel: So, faced with either no antenna or a steel wire antenna I choose steel wire every time . In the above scenario, 0.4mm steel is 15dB worse that the 1.6mm copper used in the baseline scenario. Such a solution combines the worst factors, small diameter, high resistivity, high permeability… hence the outcome. Austenitic stainless steels are non-magnetic, but be aware that working stainless steel may create martensite and even weakly magnetic steels have quite high resistance at radio frequencies. 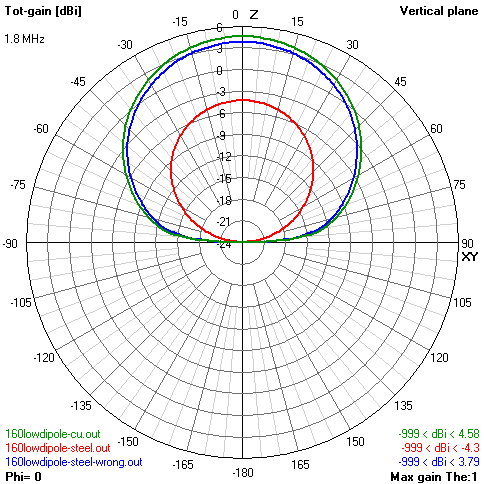 Steel wire may be quite lossy for wire antennas on HF. Readers ought critically assess the content of Ham Radio magazines and journals, and online information. Duffy, O. 2009. Loss in antenna conductor materials . VK1OD.net (offline). ———. 2009b. Skin depth calculator. VK1OD.net (offline). Robinson, J Ed. nd. INGAL specifier’s manual. Terman 1955. Electronic and Radio Engineering: McGraw-Hill New York.